This monster is the Fortune Lady counterpart of Fortune Fairy Hikari. This monster appears in the artworks of Inherited Fortune and Time Passage. Fortune Lady Fire: If you Special Summon “Fortune Lady Fire” in Defense Position by the effect of “Fortune Lady Light” while “Level Limit – Area A” is active, it will be switched to Attack Position and its effect will activate. When "Fortune Lady Light" is returned from the field to the hand, you can activate its effect and Special Summon another "Fortune Lady" monster. If you do so, then you must show the "Fortune Lady Light" to your opponent. : Can the effect of "Fortune Lady Light" be activated when it is returned from the field to the hand? 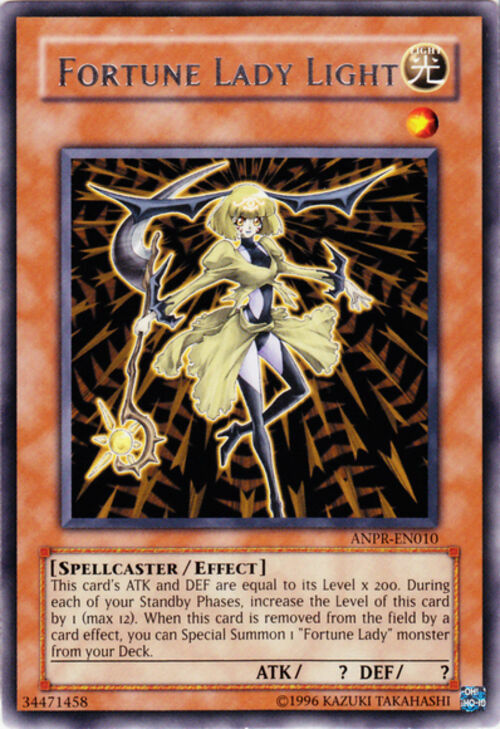 If "Fortune Lady Light" becomes an Equip Spell Card by an effect like "Relinquished" or "Destiny Hero - Plasma", then when it is removed from the field its owner can activate its effect which Special Summons a "Fortune Lady" monster. : When a "Fortune Lady Light" being treated as an Equip Spell Card is removed from the field, does its effect activate? If your "Fortune Lady Light" is removed from play from your opponent's field permanently by an effect like "Dark Core", then you can activate its effect and Special Summon a "Fortune Lady" card from your Deck. If your "Fortune Lady Light" is removed from play from your opponent's field temporarily by an effect like "Interdimensional Matter Transporter" or "Dimensionhole", then your opponent controls "Fortune Lady Light" so he can activate its effect. : Can you activate the effect of your "Fortune Lady Light" when it is removed from play from your opponent's field? The effect of "Fortune Lady Light" activates after it is removed from the field. If "Fortune Lady Light" is returned to the hand from the field, then the effect activates in the hand. If "Fortune Lady Light" is sent from the field to the Graveyard, then the effect activates in the Graveyard. If "Fortune Lady Light" is removed from play, the effect activates in the place to where the card is removed from play. However, you cannot activate the effect of "Fortune Lady Light" when it is returned to the Deck from the field. : The effect of "Fortune Lady Light" which Special Summons a monster activates where? If "Fortune Lady Light" is face-down on the field and is removed from the field face-down, then its effect does not activate and you cannot Special Summon another "Fortune Lady" monster. : When a face-down "Fortune Lady Light" is removed from the field, does its effect activate? For the effect "This card cannot declare an attack unless you return 1 card you control to its owner's hand." of "Mist Valley Falcon", the monster is not considered to be removed from the field by a card effect. : When "Fortune Lady Light" is returned to the hand when declaring an attack with "Mist Valley Falcon", can its effect be activated? Example: If "Mist Valley Falcon" attacks by returning "Fortune Lady Light" to the hand, then you cannot activate the effect of "Fortune Lady Light" because "Fortune Lady Light" is not removed from the field by a card effect. Suppose you control "Fortune Lady Fire" and "Fortune Lady Light". If you activate "Magical Dimension" and Tribute "Fortune Lady Fire" to Special Summon "Fortune Lady Water" and then destroy "Fortune Lady Light", then afterwards only the effect of "Fortune Lady Light" will activate. The effect of "Fortune Lady Water" will not activate because you do not control "Fortune Lady Light" when the effect activates, even though you controlled "Fortune Lady Light" when "Fortune Lady Water" was Special Summoned. : When the effect of "Fortune Lady Water" would activate, if you do not control another "Fortune Lady", then will the effect activate? 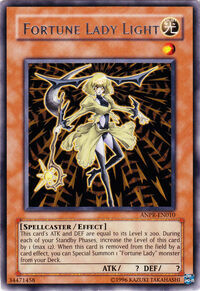 For the effect "● You can remove from play this card and 1 face-up monster you control, and draw 2 cards." of "Cyber Valley", you draw the cards after removing from play the monsters; the two do not occur simultaneously. Thus, if "Fortune Lady Light" is removed from play by the effect of "Cyber Valley", then afterwards you draw cards, so you miss the timing and cannot activate the effect of "Fortune Lady Light". : For the effect of "Cyber Valley", do you resolve the part which removes from play at the same time as the part which draws?